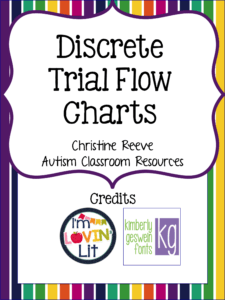 I’m back today with a brief post to share some summaries of discrete trial procedures that you can download and use in your classroom. These are part of a set of materials of reminders for adults that I’m working on that will eventually be available in my store. I wanted to share these with you for free though because they summarize much of what the series on Effective Interventions in ABA has been discussing for the past few months. I’ve included 3 posters that you can download at the bottom of the post for 3 different approaches you might be using. 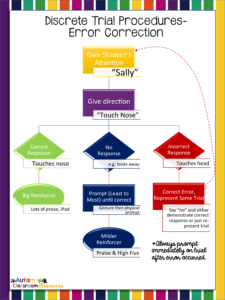 This first one outlines the procedures if you are using a general errorless learning procedure. I talked about this procedure in this post. In this procedure it is possible for the student to make mistakes if you don’t prevent it fast enough, or if it’s a verbal trial in which you couldn’t prevent an error. So, I included the procedure I have always used when errors occurred. 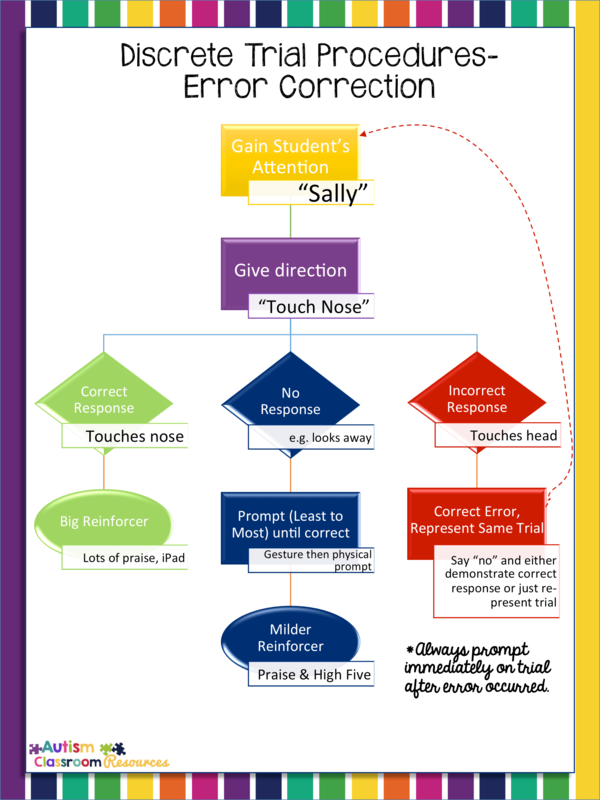 This works well for students who struggle with hearing “no” and avoids attending to the error. I just pick up the materials and re-present the trial without making any mention of the error. 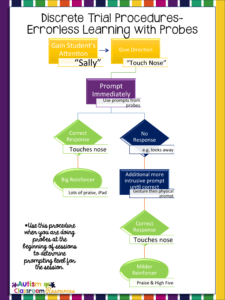 This flow chart shows the procedures if you are using errorless teaching and are doing probes at first to determine what prompting level to use. In this procedure, you would do probes of each skill/target before the session and then use that most intrusive prompt needed for that skill for each trial. In this way you are prompting immediately so errors should not occur, even in verbal trials. Read more about this here. 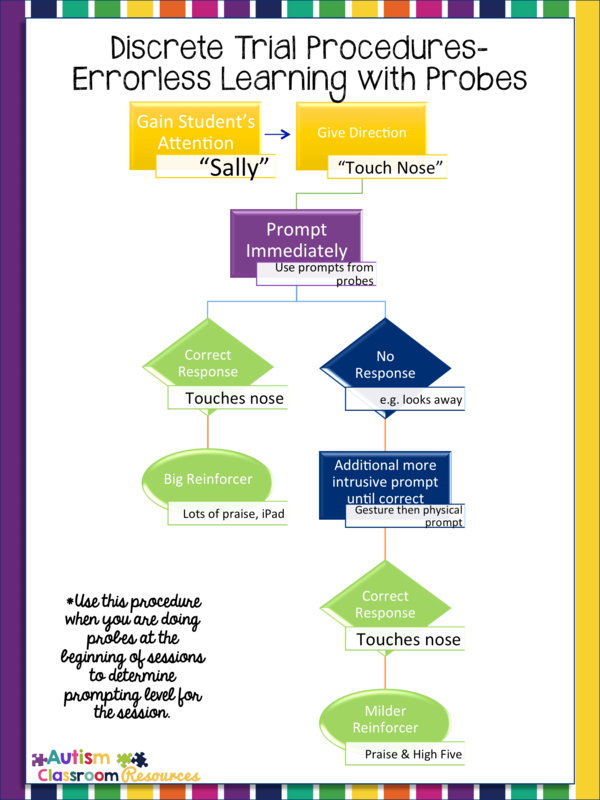 And finally, this chart shows the use of an error correction procedure. The arrow indicates that when an error is made, you give a correction. You may demonstrate the correct answer and then go back to re-present the trial. Just be careful to prompt quickly in that next trial or make the trial easier (e.g., fewer distractions) to avoid having multiple incorrect trials in a row. 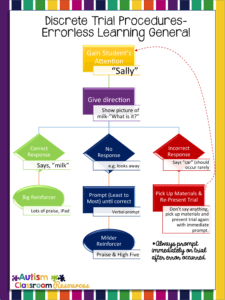 If you are using a no-no-prompt strategy, you might have 2 trials consecutively with errors. Read more about that here. 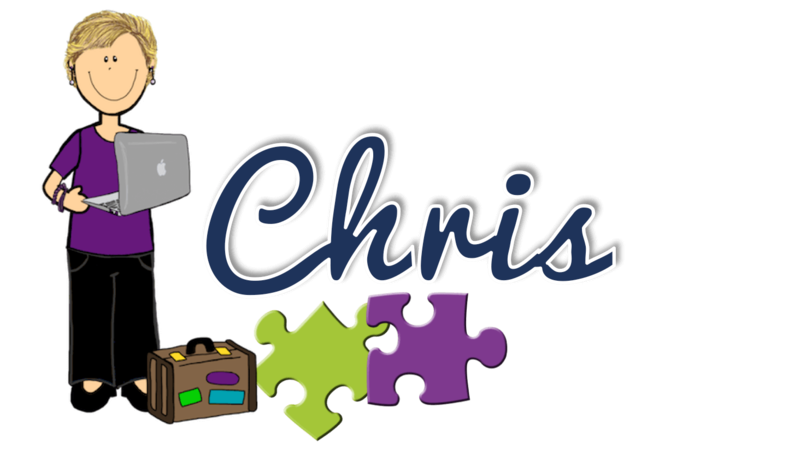 Finally, I created this because many of you indicated that having something to share with staff and families about procedures as a handout or other tangible material would be helpful. I also created them because it’s important to have visual cues for the adults, not just the students. We all write notes to ourselves, follow signs, and need reminders. 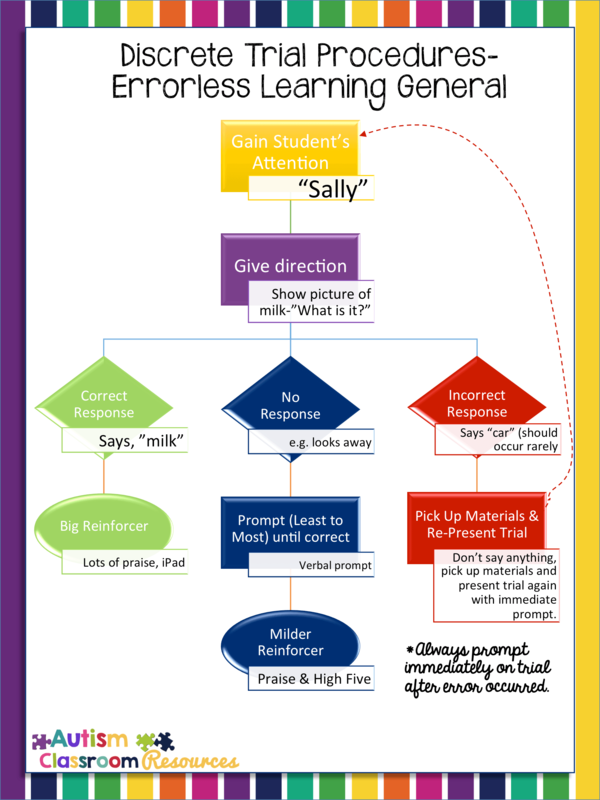 These can serve as reminders for those just learning to implement trials. I often post these in the trials area as just a reminder to everyone and find them helpful. I will post back here as well as in another post when I finish creating the additional visual reminders package and it is available in my store. 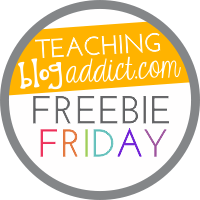 I’m also linking up with Teaching Blog Addict’s Freebie Friday! Click on the picture to check out lots more freebies!